Bonjour and welcome to the Cafי de Paris! Take a seat and enjoy beautiful graphics, generous bonuses and of course big wins! Play at home or on the go on all your mobile devices! 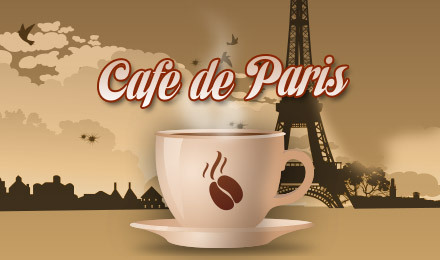 Sit back, relax and enjoy a nice cup of coffee as you spin to win Cafי de Paris Slots. It's an elegant game with 25 paylines and reels full of French cafe-themed icons. The Wild is the Cafי de Paris logo and your Scatter is the Cafי symbol, which will trigger your FREE spins. They can be retriggered giving you even more chances to win! You can enjoy this slot game anytime, anywhere when you play on all your mobile devices. Who knows where you next big win will be?